MS Stavangerfjord is a Danish cruise ferry operated by Norwegian ferry operator Fjord Line. 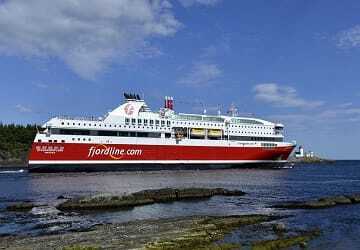 It is the first cruise ferry in the world powered exclusively by liquefied natural gas. With the MS Stavangerfjord measuring 170m in length and 27.5m in width she is able to accommodate up to 1500 passengers onboard with space for over 600 vehicles in its garages. 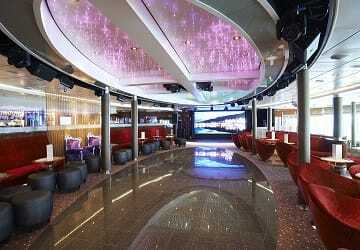 There are numerous amenities onboard such as tax free shop, outside deck bar, three restaurants and entertainment to suite all ages. MS Stavangerfjord features 306 air-conditioned cabins, there are 8 different classes of cabins guests can choose, ranging from comfortable standard cabins to luxury suites. 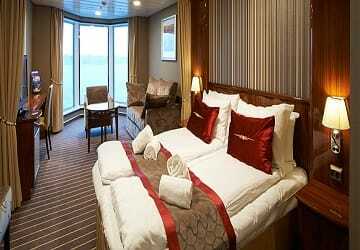 There is also selective seating throughout the vessel if you don’t wish to purchase a cabin. Onboard the MS Stavangerfjord there is no shortage of places to eat and drink. Choose from the wonderful tapas menu at the Bungalow Wine & Tapas restaurant or help yourself in the family friendly self-service eatery Oasis Garden Café. 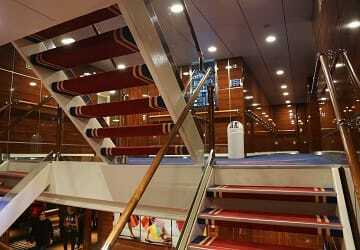 There is also a new steak house onboard which serves world class beef from Canada. Located on at the stern of deck 6 is an impressive 500 squared metred shopping centre. Here you will find ample selections of, clothing, cosmetics, accessories, candles and much more. If assistance will be required before, during or after your trip then it is advised to let us know at time of booking and subsequently you should inform Fjord Line staff at check-in. For those travelling by car there are lifts connecting the car deck to the reception deck and cabin decks. Please note that disabled cabins can only be booked by telephone. Please Note: Whilst we have taken great care in making our MS Stavangerfjord guide as accurate as possible, onboard facilities, services and entertainment may vary depending on the date and time of year that you travel, facilities mentioned may change without notification and ferry companies reserve the right to operate vessels other than those mentioned at time of booking without prior notification. When you consider the holiday season and therefore the amount of people and vehicles everything went smoothly albeit with some delay. But because of calm weather the crossing was pleasant, even disembarkation was quickly and smooth. Fantastic cabin for four people. Everything was neat and complete, even the minibar was included. The breakfast was nicely complemented. And the view in the morning was breathtaking to the direction of Bergen. A very nice experience.